I cooked chickpeas for hummus. The remaining chick peas broth I used to create this delicious healthy soup 🙂 It is pretty cool to get double benefit from cooked chickpeas. I used to discard the remaining water and always felt uneasy about it. I am not doing it anymore. 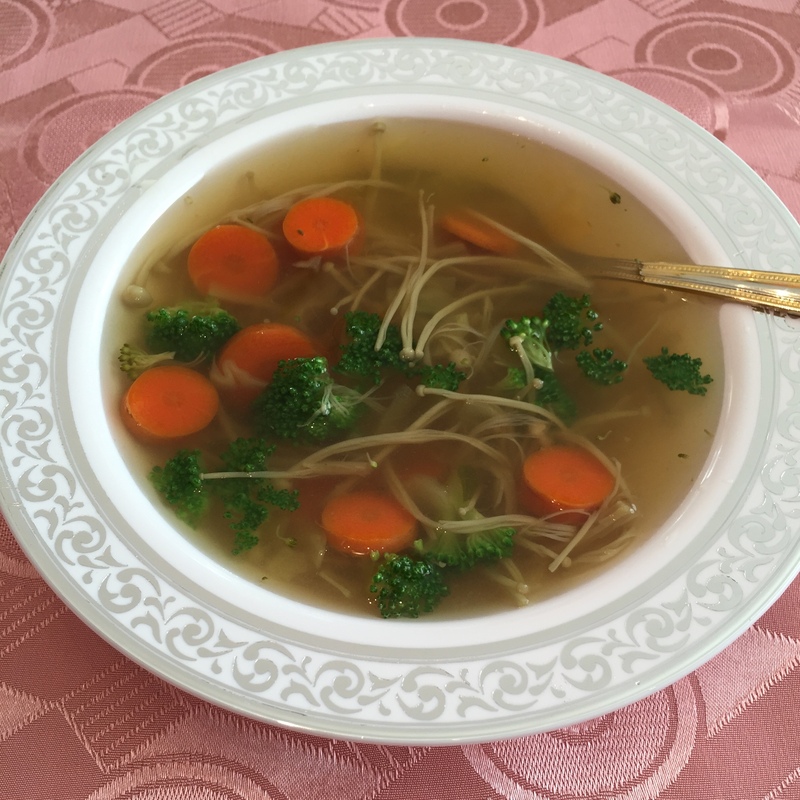 Such a delicious nutritious protein-rich sweet broth! It is a great base for various vegetable soups. Additional water is required to achieve the desired consistency and quantity. I am still getting kick from the idea of 2 for 1 – EASY !!! Combine chickpeas broth and water. Add enoki mushrooms. Start cooking on a medium flame. 10 minutes later add thinly sliced carrots, chopped cabbage and salt. Cook for 8 minutes. Add turmeric powder and in a minute add broccoli florets. Taste for salt. Oregano can be added if desired. One minute later turn off the heat. Serve hot. Garnish with parsley. Enjoy! Tip** Enoki must cook for 20 minutes.